Every year, Boo Radley* poses in a costume for a Halloween post on GWS. 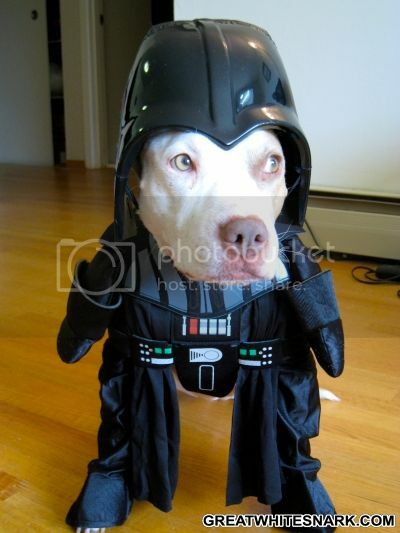 This year, I don’t feel like she’s fully committing herself to her Darth Vader dog costume. I sense a decided ambivalence for the dark side of the Force, don’t you? Of course, she seemed just as disenchanted with her Yoda and Princess Leia dog costumes. Maybe something along the goth lines next year. Wednesday Addams? Big shout-out to Costume Craze for sponsoring this post by providing Boo’s costume. You should check out Costume Craze’s vast selection for all pressing pet- or people-costuming matters. And if you enjoyed this year’s costume, please speak up in the comments; if Boo’s ego doesn’t get generously stroked at least once a day, she anger-shits all over the rug. * A.k.a., “Miss November 1” in the Dog-A-Day Calendar 2010. No joke, people. She’s in there. I’d hate for her to do any anger-shitting. Tell her she looks awesomely scary in that costume!